These contemporary glass rugby awards are supplied complete with a quality presentation case and make outstanding awards for a wide variety of rugby prizes and achievements. 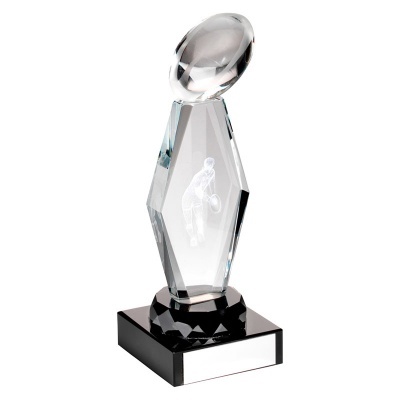 Available in three size options, they feature a glass column inset with a laser encapsulated image of a rugby player and topped with a glass rugby ball. The column is mounted on a multi-faceted circular collar and set on a square base with an engraving plaque. Supplied in an attractive presentation case.